RollerCoaster Tycoon 3 is an amusement park simulator, but some of my friends grow confused when I tried to explain to them the "point" of the game. It's not an RPG where you try to save the world, nor does it make so much as an attempt at telling a story. The best real life counterpart I can think of to the RollerCoaster Tycoon games is playing with legos, which I defend as a very mature thing to do for a fresh college graduate. I'm an adult now – I'll do what I want, Mom. More simply, there really is no concrete objective. RollerCoaster Tycoon 3 is for gamers who genuinely enjoy creating things. If you've ever played Starcraft and focused on designing the perfect base instead of beating the other team, or if architecture runs a thrill up your leg, this is the game for you. 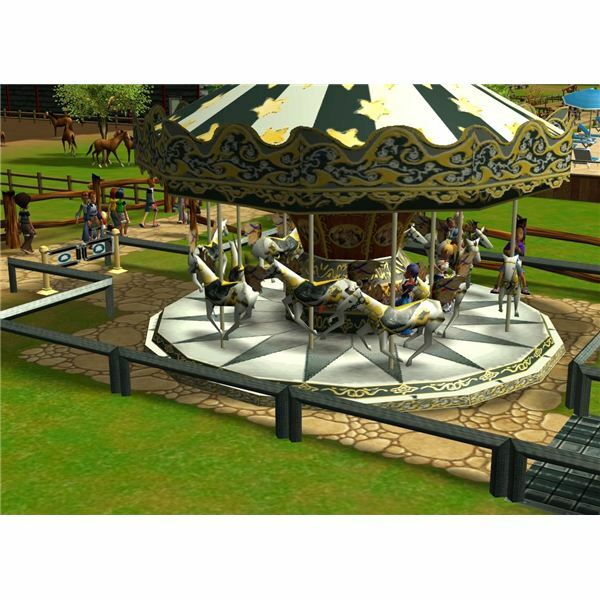 Certainly, anyone who enjoys amusement parks will love this sim. While the game is starting to show its age at seven years, RCT3 is highly enjoyable, and its colorfully cartoonish game engine smooth over the outdated graphics. The soundtrack isn't groundbreaking, but it's full of distinct themes, some of them variations on real movie scores (for example, "Prairie Rider" is similar to the theme from The Magnificent Seven). RCT3 isn't just for kids, even though it might be marketed towards them. I wasn't kidding when I mentioned enjoying the game. Anyone can create a basic amusement park, but it's a challenge to create the perfect one. If you don't believe me, go try your hand at a few of your own, then check out some user-created parks on Youtube. I've probably created hundreds of parks over the years, and I still find myself disappointed that somebody else thought of an awesome idea before me. Some people obsess over this game. It's not uncommon to hear of a player working for two weeks on a single park to nail every detail. There are even reports of teams of players working together to finish amusement parks and bounce ideas off one another. It's "for kids" the same way candy is "for kids" – adults might hide their desire better, but it's there all the same. RCT3 is a surprisingly complex game, so any RollerCoaster Tycoon 3 guide should be comprehensive enough to cover all aspects of the game. Rides and attractions form the basis of any amusement park, but upkeep, finances, research, and other components of the game all play vital roles. 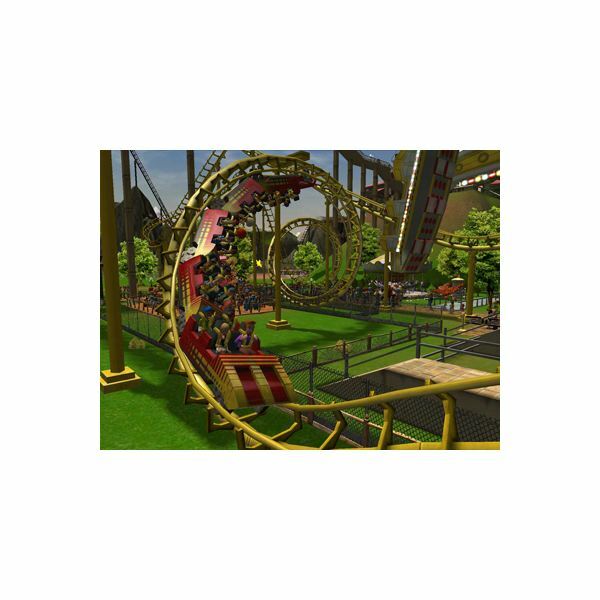 Well, the first thing anyone realizes about RollerCoaster Tycoon 3 is that it features a completely redesigned graphics engine which renders in 3D. I know, I know, it finally caught up to games 15 years ago. Still, it's a welcome change from the isometric game engine from the first two titles. Since the game's rendered in full 3D, you can look at your rides from any angle, though the camera can't look up – it can only down or, at the most, horizontally. However, the 3D engine also allows for the game's ride cam. You can finally open up your rides and put yourself in the coaster seat. Considering the RollerCoaster Tycoon 3 Platinum Edition (which features the original game and two expansion packs: Soaked! and Wild!) costs a whopping $30, about half the average amusement park ticket, it's the closest most of us will get to riding rollercoasters on a daily basis. Thankfully, the game's also been updated with tons of new rides and features. We get some new rollercoasters, like the multidimension coaster with freely rotating cars, new thrill rides, and new shops. More importantly, we also get pools and animal enclosures, allowing us to construct literally any type of amusement park imaginable. I can't vouch for how the basic game and expansion packs operated when they were released, but many of the rides and other updates from the expansion packs are integrated into each of the Platinum Edition's campaigns. The game's also swapped out attractions from real Six Flags amusement parks and replaced it with Hershey Park, the amusement park associated with Hershey's Chocolate. A few other world famous coasters and rides are included, like Expedition GeForce from Germany, rounding out the real attractions included in the game. Since this RollerCoaster Tycoon 3 guide will feature a number of unfamiliar terms, a quick overview of the user interface is in order. Once you're in a scenario, you can move the camera around using WASD, arrow keys, or holding the right mouse button. Use the middle mouse button to zoom in and out, or hold it to change the camera's angle. Opening up these panels reveals many more options, but the information in this RollerCoaster Tycoon 3 guide will be overwhelming enough without going over it all in excruciating detail. Every ride in the game has a tab called Test Results. There are a number of panels you can look at, but we'll focus on Basic Test Results for now since they're the most important. Basic Test Results provide three ratings for excitement, intensity, and nausea. The ride's excitement rating solely determines how much money peeps are willing to whip out to get on the ride, and the rating is impacted by many factors, including the other two ratings, intensity and nausea. There are really too many factors to cover here, but this RCT3 wiki page covers it pretty effectively. However, you should strive to make rollercoasters unique experiences. Repetitive actions, such as ten loops in a row, decrease the excitement rating. Scenery can provide a significant excitement bonus as well. Intensity combines different factors like speed and physical forces, like how much air time riders receive. Making the ride too intense lowers excitement rating, but a low intensity rating does the same thing. If a rollercoaster's intensity is too high, consider banking curves, removing some of the sharper turns, and even constructing the coaster closer to the ground. Nausea is pretty much what you'd expect. Making too many twists and turns makes peeps want to throw up, and high nausea ratings will turn many peeps off. There are ways to combat peeps' propensity to vomit, but those methods are covered in later sections. Ideal ratings for rollercoasters include excitement levels of at least 6, intensity ratings in the 5-9 range, and as low nausea as possible. Other rides, like Gentle Rides, have low ratings in all three categories. Roller coasters are your main money makers. They're also the most expensive rides to construct and maintain, and a poorly conceptualized coaster can turn peeps off. Each type of coaster has anywhere from two to twenty pre-designed models that you can purchase for anywhere from $5,000 to $40,000, but you can get more bang for your buck by designing your own with the Custom Track feature. Placing a roller coaster, or any other ride or attraction for that matter, requires an entrance and exit. Some attractions (shops, facilities, and animal viewing galleries) don't require extra space, but most rides force you to build an entrance and exit, both 1 tile in size. For most rides, you'll also want to include queue lines, which is covered in greater detail in the Paths section. While you'll want to build a number of roller coasters (they attract lots of peeps and make a lot of money), they aren't the only rides you'll want to put in your park. Believe it or not, some peeps don't actually enjoy them. Crazy, I know, but it's true. Starting out with an old wooden coaster is a surefire way to kickstart any amusement park. Steel and suspended coasters tend to be more expensive, and water coasters aren't quite as profitable. Who wants to just build the same coasters over and over? No, you're a roller coaster tycoon. You want to build the coolest, scariest coaster in the world, and what you can build is limited only by your imagination. To access the coaster building tool, go to the RollerCoasters panel and simply click on the icon. You can also click on the "Saved Track Design" shortcut and select "Custom Track." Each will bring up the panel to the left, giving you a ton of options to get your ideas started. Let's start with the station track. Stations are where passengers load and unload from the coaster, and it's where you'll place the ride entrance and exit. Generally speaking, the maximum length of the roller coaster cars is governed by the length of the station. Most of the time, you'll want to start off by building a chain lift up at least several dozen feet unless you choose "powered launch" to shoot the car out of the station at 50 mph or faster. The next track piece will be highlighted in light blue before you construct it. The rest is up to you, but most coasters have the largest drop at the beginning followed by plenty of twists, turns, hills, drops, and loops. There's no better way to get a feel for building coasters than to go into the Sandbox editor from the main screen and just testing different ideas out. 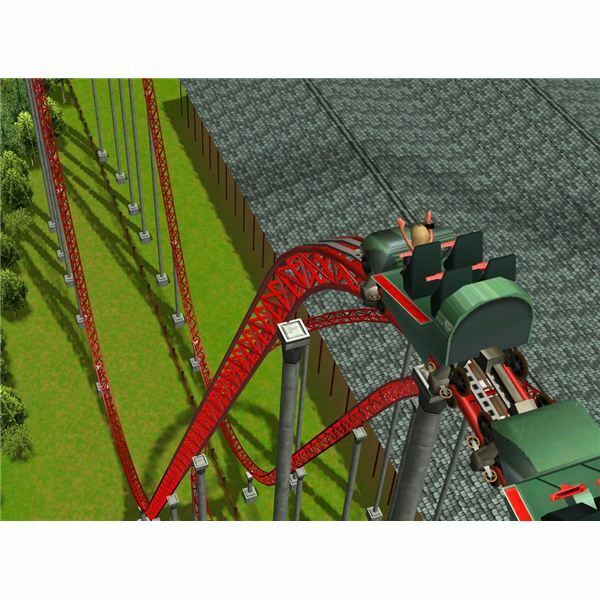 Once you create an awesome coaster that you want to use again, name the coaster something unique and choose "Save Ride" from the Details tab of the coaster. While roller coasters can provide the greatest source of income per ride in the game, it's far easier to squeeze in dozens of thrill rides. If you don't know what thrill rides are, examples include the Top Star (left) and Top Spin (right). These small rides spin riders around in circles, many times in all three dimensions at once. They're the rides that make some people go "awesome!" while others look away with nausea starting to settle in. xcitement is lower than roller coasters and most water slides, but they're much cheaper and smaller. That means you can fit a lot of them in the same area a rollercoaster requires, but a fantastic idea, at least to save space, is to fit rides in among your coasters. Even though coasters look like a jumbled mess of support beams, those wood and steel support beams don't actually matter in the game. 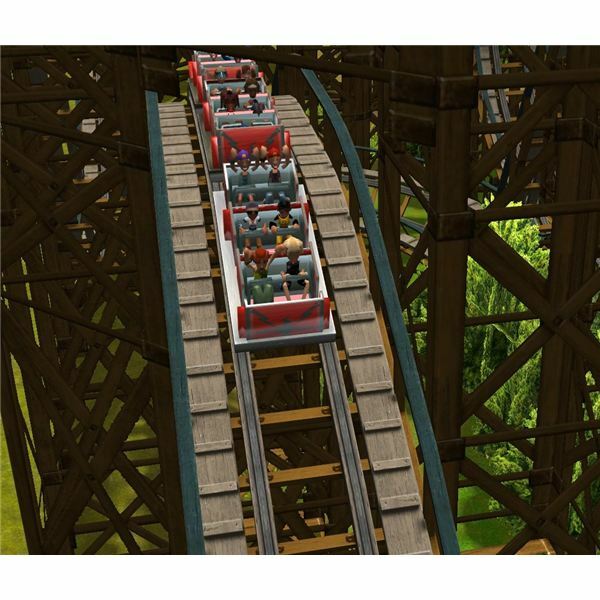 RCT3 automatically moves or deletes supports if they come into contact with another ride, building, or path. As long as the roller coaster's track isn't impacted, you can fit a number of rides into the same space. Don't want to throw up? Gentle rides cater to those peeps who have low nausea levels but still want to have a fun time. RCT3 isn't all about the furious coasters and death defying rides which appeal mainly to teenagers. There are rides aplenty for everyone. Take the aquarium, for example. 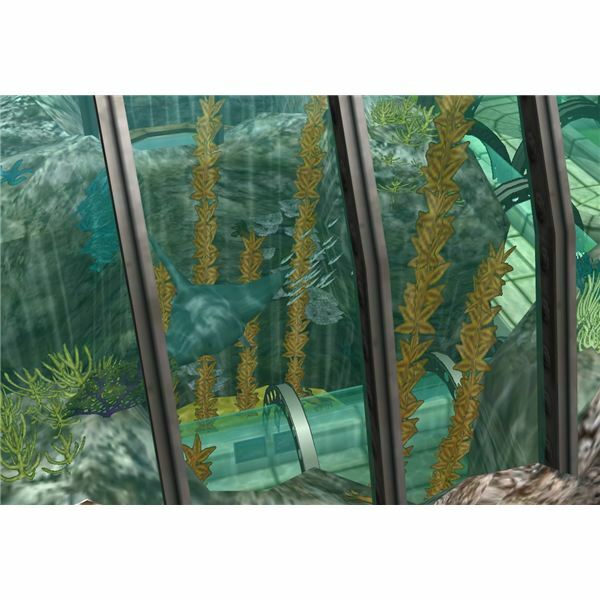 Peeps simply walk through its pathways to look at exotic fish and other marine wildlife. They walk through it at their own pace, but an aquarium can hold dozens of peeps at the same time, so many gentle rides are high occupancy. However, the payoff is that they're slow, which translates into slower ticket sales at higher volumes (it balances out). Many peeps won't be interested in such boring rides, but many peeps aren't willing to get on roller coasters because they're too scary. Having a variety of ride types gives everyone something to do (which means more money in your pocket). Kids need something to do as well. Just like you wouldn't put a six year old on the Storm Runner at Hershey Park, they'll shy away from the scarier attractions in your amusement parks. These are your run of the mill classics like the merry-go-round and spiral slide, rides which were popular once upon a time but have largely been phased out in contemporary amusement parks. Maximum height requirements mean only kids will ride them, so there's limited profitability with kiddie rides. If you're looking to entertain Junior, try your hand at building some mini roller coasters with low excitement ratings. Designing other rides for kids can provide a slight boost to your profits instead of condemning them to two or three relatively lame attractions. Of course, years ago I too rode merry-go-rounds with the best of them, but my gaze was always on the coasters in the back of the park. There's a reason they aren't located at the front. Thinking about junior rides, they're normally near the front of the park. Why could that be? Well, if peeps really want to go on the big coasters, they have to walk the whole way through the park, past all of the other rides. If they walk past the other rides, something else might catch their eye along the way. Consider the flip side of that scenario with roller coasters in the front of the park and everything else in the back. Visitors would congregate in one area without ever spreading out, and those smaller rides would be ignored by the majority of peeps. My advice is to build a couple of junior rides, but place them in a few different locations. You can't completely ignore one age segment, but don't focus on them either. A few rides should be sufficient for any park. Other rides and attractions defy all other categories, but they're closest to gentle rides. They include rides like observation towers and very slow automobile replicas. Many peeps will enjoy them, but nobody's going to find them life altering. They certainly aren't your park's main attractions. Low costs and low profits signify other rides, and if they aren't suitable for anything else, at least they inject parks with some variety. Also, rides like the observation tower allow peeps to experience panoramic views of your entire park. Combined with mixmaster displayers like fireworks, they can experience quite a spectacle. No park hurts from two or three of these rides, but constructing more is a waste of money which could be better spent on thrill rides. There's only one place in the entire game where your options feel limited, and that's only because most of us have been to zoos with fifty or more different animal species. There's still enough variety for players to amusement parks with nothing but wildlife, but most players will want to complement their animal attractions with rides. Each animal requires several other items in game to thrive: animal enclosures, keepers, and some looking after once in a while. RCT3 animals generate cash two ways: viewing gallery tickets and animal adoptions. Tickets are covered in the Enclosures section below, but animal adoptions are a mostly fun way to possibly generate hundreds or even thousands of dollars each month. Adoptions aren't what you'd normally consider adopting an animal, like you might do if you head to your local shelter and save a pet. 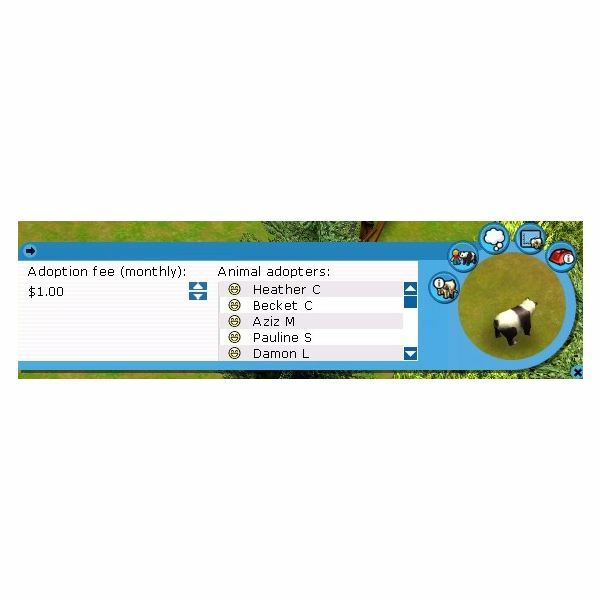 In game, adoptions are kind of like sponsorships. Peeps enamored with certain animals can pay money in support of that animal, and you can read which peeps adopted a particular animal by clicking on the Animal Adoptions tab for each critter. You can also set the adoption price in increments of $0.25, but adoptions are steady moneymakers because it's a monthly payment the peeps cough up to the park. Perhaps unsurprisingly, peeps favor young animals. Bear cubs and tiger kittens generate more excitement than their adult counterparts, but every child eventually grows up. After a year or two, animals born in your zoo will become adults. 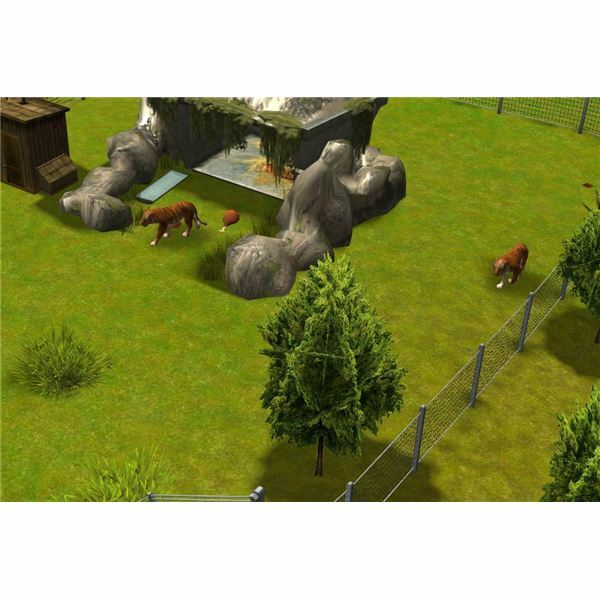 Animal enclosures are one of the least understood elements of the game. They have to provide an adequate environment for the animals, and several factors come into play. Social requirement – describes how many animals can get along in the same enclosure out of 20. If an animal is 1/10, it's very antisocial and likes to be alone. Animals at 15/20 or higher like to be surrounded by others. Space required – under the Animal Information tab, there's a "space required" amount for that particular species. If it says 100 tiles, that means the enclosure should be at least 10×10 tiles, though you can mess with the dimensions to turn it into weird shapes or oblong. Type of enclosure – each species needs a different type of fencing (wooden, chain, or electric). Stronger fences are more expensive, but they're needed to keep bigger or more agile species from escaping. A wooden fence won't stop a rhino, but purchasing an electric fence to keep horses contained just wastes money. Every animal also requires an animal house, which provides them with food and a place to rest when they get tired. If you have lots of animals in an enclosure, you can direct animal keepers to refill the food troughs more often. For less animals, reducing the frequency of meals can save a tiny amount of money every month. The last thing your enclosure needs is a viewing gallery. Three different sizes allow varying numbers of peeps to stand and gaze upon the animals, all for a small ticket cost. Sometimes enclosures break and animals escape out into the wild. Besides terrifying peeps, you aren't making any money off of them. Capturing escaped animals is a mini-game in which you take the point-of-view of a helicopter gunman. Aim your rife at the running animal and fire a tranquilizer dart to make it fall asleep. Afterwards, just drag and drop the animal back into its enclosure. With the enclosure properly set up, the next thing you need is at least one animal keeper, located under the Staff panel. Every animal house you build automatically hires a new keeper, but more animals in an enclosure may require additional keepers to clean up the poop and refill the food. Those are the only two tasks keepers can perform, but you can specialize them by deselecting one of the two tasks so they focus on just one. Each keeper has universal training with animals, so panda keepers are the same as tiger keepers, and you can drag and drop them from one enclosure to the next. Providing a clean and adequately sized enclosure is vital to animals' health, as is making sure they're properly fed. Enclosures don't have to be perfect all the time – a few mud pies lying around isn't going to kill anyone – but letting them go can jeopardize the animals themselves. If they're in danger because of your carelessness, the animal protection services can actually remove them from your amusement park. Toys are little extras to give your animals something to do, and they all form slightly different functions. Animals will just swat rubber balls and tires around, but a meaty ice block is a tasty treat for predators. Money is the closest the game gets to an actual, long-term goal. You'll quickly realize how ridiculously low the game prices buildings and rides. Most game roller coasters fall into the $5,000-$25,000 range while real life roller coasters often cost $10 million or more. It's not an exact science, but multiply RCT3 money by a factor of 1,000 to get the approximate real life value of different objects and attractions in the game. There are several main ways your park generates revenue. Peeps bring a set amount of money to the park with them, and then they use that cash to purchase everything from park entrance tickets to food. 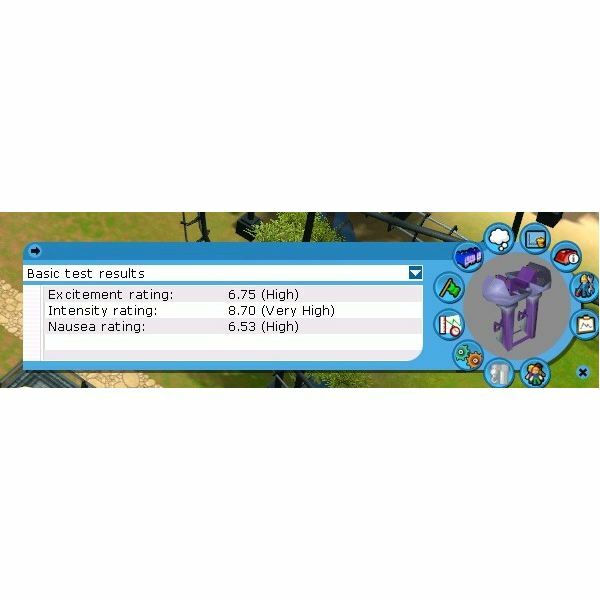 Money is one of two resources you have to be concerned with in the game, the other being your park rating described in the section below. Other factors can swing both ways. Building rides obviously costs money, but selling rides nets money equal to the cost of building them. Paths cost $12 to build on the ground, but they can be sold for $10. Some costs are one time deals, so you needn't worry about them unless you have extra cash to burn. Marketing strategies can bring extra peeps to your park, but they're by no means necessary. Just as if you were buying a house or a car, loans can give you a short term influx of cash while charging interest over time. Interest rates are fixed by scenario, and the yearly rate ranges from 4.9% to a staggering 29.9%. Thankfully, interest is deducted automatically from your coffers each month, just like any other expense. However, the game only ever pays for interest. 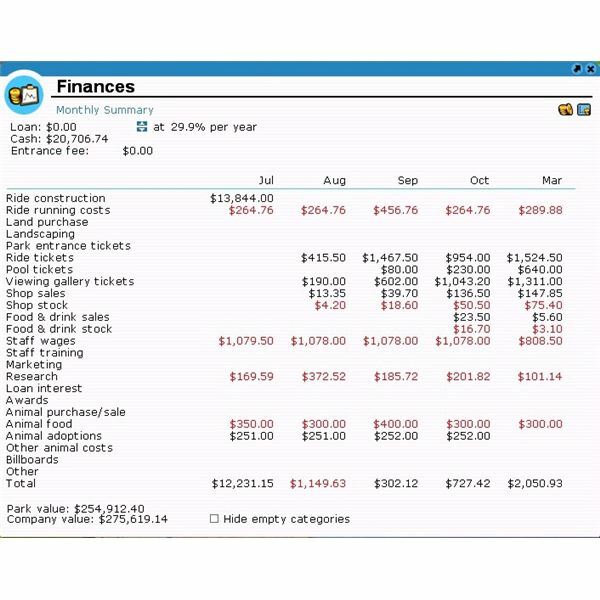 You have to open the Finances panel to manually lower your loan amount. This means that if you take out a $10,000 loan on the same day that you open your park, the principal will still be $10,000 fifteen years later. There are two times when a loan can be very helpful: when you're starting out and when you want to build an expensive rollercoaster (at least $15,000). Maximum loan amounts average at least $10,000, so you'll have a ton of cash on hand. Right after your park opens and is either completely or almost devoid of rides, the only way you're going to generate cash is to get some up and running. While you usually start out with several thousand dollars, it's better to get $20,000 worth of rides operating than it is to get half of that. Remember, the more rides your park has, the more customers will flock to your park. Even though interest payments will cut down on your profits, your profits will be substantially higher to begin with. Once you have about a dozen rides bringing in cash, you can start thinking about paying off that debt. Unlike reality, RCT3 money (or a lack thereof) can never close down your park. You'll just go further and further into debt. The worst problem you'll encounter is finding yourself unable to climb back out, but it's actually difficult to reach the point where your park is no longer profitable. If you're losing money each month, you have several options available to help you get into the black. Start building – Even if you have to take out a loan, constructing additional rides and attractions will bring in more customers. More customers means more cash. Spending more now actually means you'll be able to spend more later. If the first option isn't available (if you're out of cash and already have the maximum loan possible for example), start selling. Scenery usually nets a few dollars. If the scenario comes with hundreds of pieces, you could use the profits from selling those decorations to build another small ride. When you're out of money, even a few hundred dollars can make a huge difference. Fire excess staff members. Staff members are another significant cost. You always want to keep at least one mechanic and handyman around to sweep pathways and fix rides, but there's no need to have a dozen of each when you're just starting out. Stop research – the default research budget is $200 a month, and you can lower that to $0. After I've exhausted the other options, cutting my research budget usually fixes 95% of my remaining debt issues. Who knows if RollerCoaster Tycoon 4 will ever be developed? Some hints indicate that it may already be underway, as evidenced by this Atari forum post in which a company employee asks players what features they'd like to see in a new game. The title also has a page on IGN, but it doesn't contain any information yet. Maybe it's just wishful thinking, or maybe it's a hint that a new game is at least being considered. All images and references from Roller Coaster Tycoon 3 and author's experience. 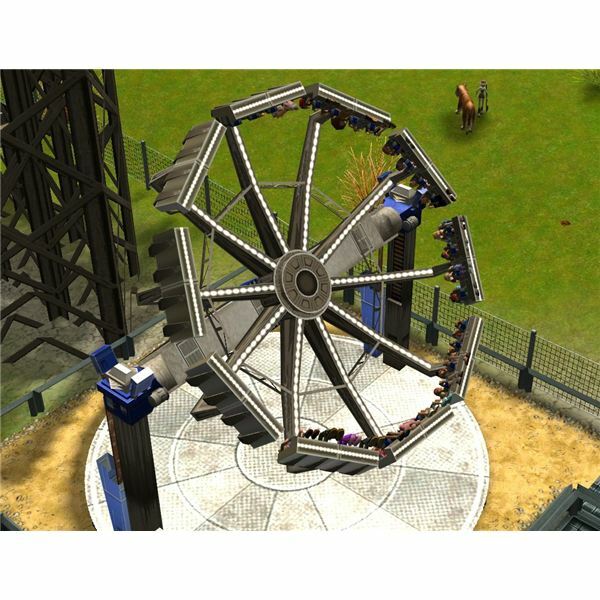 RCT3 is an amusement park simulator beloved by both kids and adults, but it’s surprisingly complex with hundreds of choices. Choose wisely, and your park will heap untold riches. Choose poorly, and you’ll only be remembered for your failure.